The topic you want to know most about during our visits is load security – how we apply the rules and what drivers can expect at the roadside. We’ve addressed the most common issues here, to share our responses with a wider audience. What is a secure load? A secure load is attached to the vehicle so that it will not fall off or affect vehicle stability and pose a risk of danger or injury to other road users. So, here at VOSA, we expect a load to be secured to the vehicle bed to prevent 100% forward, 50% sideways and 50% movement to the rear. You can use internally fitted straps hanging from the rails of a curtain-sided vehicle to secure a combined load and pallet of no more than 400kg in weight. The ideal solution is one strap across two pallets from rave to rave of the bed of the vehicle. You may need more straps if there are not enough fitted to the vehicle or trailer. You will need to sheet unsheeted, open vessels – such as skips – and bulk-carrying vehicles when carrying loose loads. If the load expands over the height of the sides of the vessel, you must use additional security. We will issue a prohibition and fixed penalty of £100 for any load found to be insecure. You can contest the prohibition and fixed penalty in court, by completing Part 2 of the fixed penalty notice and returning it to our Fixed Penalty Team in Swansea. Full address details are on the notice. We have also supplied a load security matrix. 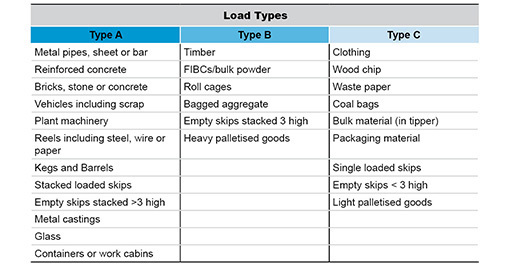 This is a chart that will help you to work out what kind of security you need to apply to different types of load – and what our response will be if you fail to meet the standard. This is the matrix that our own officers use, so everyone is using the same information to work out how secure your load is.